I really like this cream, I've seen a slight reduction in my dark circles and maybe a few fine lines are gone as well. The applicator allows you to apply just the right amount without worry of the product being exposed to too much air. I wish it were a little lighter in texture - because it is thick, I have to be very careful to apply it with patience and not tug the delicate skin. I have noticed smoother skin texture around my eyes and a decrease in my dark circles. 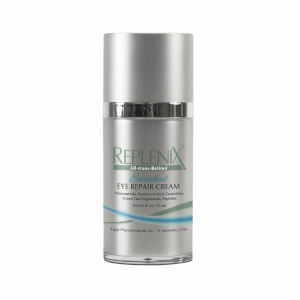 I am an eye cream junkie.Used to love the Topix eye cream for lightening and bags. I use this at night. I really notice a difference when I wake up. Bags lessened, lifted, and smoother texture around eyes. I use this at night and Dermalogica multi-firm during the day. I will not switch this regimen ever. I give it 4 stars because I got it when there was a big deal and it didn't do anything bad. I decided to try after I read all of those overwhelming reviews. But I didn't work great for me. I didn't see my eye bag disappearing, though I don't blame it as I know eye bag is hard to work on. I'm not sure whether it works for dark circle or fine lines since I didn't have those problems. People say if an eye product can prevent things getting worse then it's a good one. Replenix is a good one in this sense. This is the only eye cream that is gentle enough for my eye area. I also use it across my cheek and nose; it is excellent for reducing pore size and has a noticeable effect. I'm frequently told by strangers that I look young for my age (10-13 years younger), but IMO, it's strange to hear that. My eyes look much older than my age. I've had allergies all my life, can't seem to quit rubbing them absentmindedly, wore contacts frequently and was a sunbather. My entire undereye orbit area is covered w/ fairly deep lines and crosshatchings. I have moderatel crowsfeet and all over lid crepiness upper and lower too. I have found treatments that work well in improvement, but I usually become tolerant to them after 6 mos and have to try out another batch to find another that will work. Well, this is my winner for the past 3 mos. No miracle, but has noticably reduced deep wrinkles and faded the small. Has some tightening effect, which made my purplish red allergy circles look lighter. I use it twice/day and haven't experienced any problems unless I get it to close to my eyes, but my eyes are extra sensitive! easy too use it works grate!It also helping with my dark circles. This is the best eye cream. I have tried many and this eye cream has really reduced puffiness, discoloration, smooth out my fine lines, and non-irritating. I've been using this product now for over a year and the skin around my eyes have truly improved! Have purchased this product several times and found it to be quite moisturizing.it appears to diminish the dark circles.The down side is the small container ,does not last too long ,do not like the pump because I feel I cannot get the very last remnants of the product,wish it came in a jar and you can see what is left!! Its rather pricey but skinstore will honor another sites price if it is lower elsewhere. (price protect policy).That is definitely a plus.and they credit the difference very quickly.